Prachuap Khiri Khan in Amphoe district is worth adding to your travel plans if you’re looking for a place to experience a very different kind of Thailand. Located on the narrowest part of the peninsula connecting Thailand with Malaysia and sharing a land border with southern Myanmar (Burma), Prachuap Khiri Khan has some amazing attractions most tourists will never see. 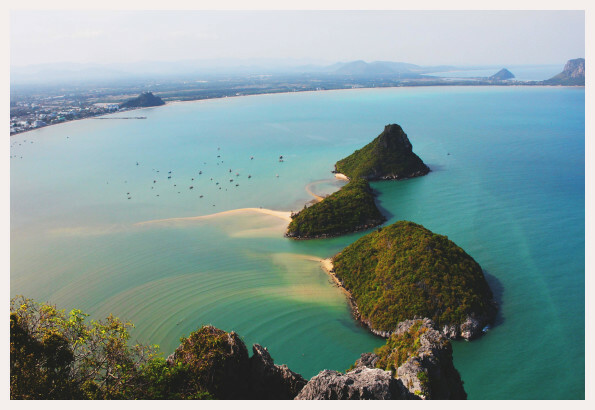 Only two hours south of Bangkok, a little further south from Hua Hin, Prachuap Khiri Khan literally means “city in the mountains” and boasts the twin attractions of gulf beaches and pristine national parks. In fact it’s so beautiful that the Thai royal family once claimed it as their exclusive holiday destination and many of Bangkok’s elite still have holiday homes in this area. Western expats are also making their homes here. Prachuap Khiri Khan is a slow, laid back and chilled out town where life moves as snail’s pace. But it’s also incredibly friendly and welcoming as well as being incredibly cheap. The main industry here is the Thai air force base (a former US base in WW2) that you can actually wander around. It even has its own hotel (Wing 5 Hotel) with rooms for about 1200 Bt per night. Most of the people in this area are Thais of Chinese origin and although Prachuap Khiri Khan is much quieter than comparable tourist destinations like Pattaya or Hua Hin, they make sure it’s no backwater for tourism. There are even some very respectable tourist resorts. Prices start from around 300 Bt per night and range up to 1200 Bt per night, but expect to pay around 500. The best places to stay are around Khlong Wan. There are trains every day from Bangkok’s Hualamphong railway station. The No 43 train leaves Bangkok at 8:05 am and arrives in Prachuap Khiri Khan at about 12:30 pm with a stop in Hua Hin. There are air-conditioned carriages available, but they aren’t the most comfortable we’ve experienced. Your 500 Bt train ticket includes onboard snacks and drinks, but you’re better off to buy something before you leave. The railway station in Prachuap Khiri Khan is close to the centre of town at the top of Kong Kiat Rd. There are also buses from the Borommaratchachonnani Rd bus station (aka Krungthai Bank bus terminal) in Bangkok every hour from 4:00 am until 8:00 pm. The bus trip takes 5 and a half hours and costs about 160 Bt. The bus will drop you off on Phitak Chart Road just of Kong Kiat Rd, near the town centre. X2 Kui Buri – 52 Moo 13, Ao Noi. Rooms from 3,900 Bt per night. A bit out from the centre of Prachuap Khiri Khan but gets a lot of positive reviews and has all the resort facilities. Avoid the rooms facing the pool. Ask for a beach front or ocean view room. Nice quiet beach. Prachuap Beach Hotel – 123 Susek Road. Rooms from 800 Bt per night. Much more conveniently located on the boulevard near the main beach. Very friendly staff. Nice ocean views from the upper floors at the back. Free wifi. Kuiburi Hotel and Resort – 18/3 Moo 5, Bonok. Rooms from 1700 Bt per night. Clean and nice but not too flashy, nice sandy beach. Request a room at the back and pay for the deluxe rooms as the standard rooms are a little small. Try the red curry salmon fillet from the restaurant! Dhevan Dara Beach Villa – 78 Moo 5. Rooms from 3,100 Bt per night. About 5 minutes from the national park. Long deserted beach. Rent a bike and ride up the coast. Food suits local tastes, but good nearby eateries like Twiggs Bakery and Cafe (for breakfast), the Top Deck for lunch and La Vite for dinner. Hadthong Hotel – 21 Suseuk Rd. Comfortable rooms, nice breakfasts, nice ocean views and a clean beach just across the road. Swimming pool and free wifi. Check out the sunrise over the bay. Compare these and other hotels in Prachuap Khiri Khan on TripAdvisor. One of the big drawcards for Prachuap Khiri Khan is the Monkey Temple, Wat Thammikaram, on the outskirts of the town. Climb the 420 steps to the top of the temple, be entertained by the monkeys as you climb, then experience the amazing views from the top of the temple into nearby Myanmar. Prayanakorn Cave in Samroiyod National Park is well worth the climb (or just cheat and get a boat to the front of the cave for 400 Bt) for a stunning view of the national park. When you get down to the inside of the cave there’s beautiful stalagmite and stalagtite formations. The City Pillar Shrine is walking distance from most hotels in Prachuap Khiri Khan and is best visited in the morning when the sun shines on the front. The main shrine is surrounded by four smaller shrines, each of interest. Khao Chong Kra Chok is a major climb with 356 steps to the top but you’ll be rewarded by a unique and peaceful hill top temple and a very well entrenched tribe of monkeys who can be quite aggressive if they think you’ve got food. Again, best tackled early in the morning when it’s cooler. If you happen to have a visa for Myanmar, there is a border crossing about 10 kilometres from Prachuap Khiri Khan is the border crossing at Singhkorn Pass where you can enter Myanmar and visit the nearby markets. Get right out of town and experience a farm stay at the Ban Fang Tha Wildlife Preservation Village where you can stay on the banks of the Pran River among the mangroves and enjoy local fruits like aromatic coconuts, sapodillas and mangos. Visit Ao Manao bay to experience white sand beaches on a scale that compares to Pattaya or Koh Samui, but without the crowds. Although the water is no completely clean here, it is a good place to swim and snorkel or just laze about on the beach. Just be aware that because Ao Manao is part of the air force base, the gates close after dark. Watch the video below by Ben Grummels for some ideas of what you might find in and around Prachuap Khiri Khan. Have you visited Prachuap Khiri Khan? Share your views with us using the comments field below. Got questions about Prachuap Khiri Khan? Add them below and we’ll do our best to answer them.